In honor of Auden’s birthday today. Last month marked four decades since W.H. 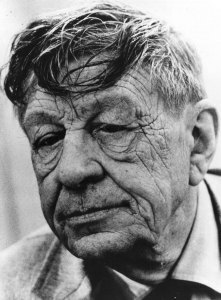 Auden died (he was only 66). How has he managed to retain that oracular hold over us, to continue to play the role of prophet? Auden himself abjured the myth that attached to his earliest work, the poems that first made him a celebrity. He later pointed out the foolishness of the fake choice – “we must love one another or die” – and steeled himself against the Siren sway of poetry’s utopian promise, even as he embraced other utopias.